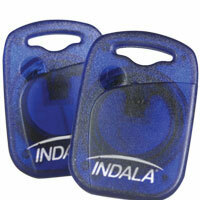 RF IDeas Indala Proximity - Indala FlexKey Keyfob 26 bit FC45. 100 unit minimum order. A large selection of proximity and contactless Smart Cards, badges, ISO printable cards, keyfobs and adhesive discs. The array of proximity and contactless cards include Indala Proximity cards, HID proximity prox, proxy & iCLASS, ISO15693, Casi-Rusco, Pyramid, AWID, IOProx, MIFARE, LEGIC, and more. The RF IDeas BDG-FPKEY is also known as RFIDeas	BDG-FPKEY	or BDGFPKEY	.